The center was founded through the efforts of Gochen Tulku Sang-ngag Rinpoche, the sixth Gochen tulku in the Nyingma school of Tibetan Buddhism. In 1993, Tulku Sang-ngag first came to the United States from India, where he had been living in the Tibetan refugee community, and began to found centers to promote the teaching of Buddhism in the United States. The center in Arlee, MT, is his official seat in the U.S., where he now lives and teaches. For a more complete biography see an interview with Gochen Tulku Sang-ngag Rinpoche on the Ewam website. 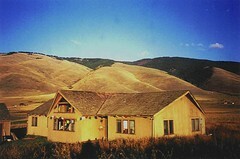 The Three Yogas Retreat Center is located on 850 acres of land just outside Gochen Tulku Sang-ngag Rinpoche’s American seat at Ewam Sang-ngag Ling in Arlee. Under the guidance of Rinpoche, people can stay for the traditional three-year retreat to study and practice Maha, Anu, and Atiyoga. Because it is often difficult for participants to dedicate three continuous years to retreat, people can also stay for three, separate, one-year retreats that focus on one of the three yogas each year. Mahayoga focuses on ngondro and “generation stage” practice (Kyerim). Anuyoga concentrates on yogic practices that work with subtle energies of winds and channels (tsa lung and trul kor). Atiyoga focuses on Dzogchen, or “completion stage” practices (trekchod and togya). Shorter, week long retreats are offered and lead by Gochen Tulku Sang-ngag Rinpoche as well. Rinpoche also leads the local Montana sangha, known as Sang-ngag Ling, in weekly practice. They meet at the center, Ewam, on Tuesdays at 7:00 p.m. As a group the sangha practices the Pengyal Lingpa cycle of Green Tara, Tsasum Lingpa ngondro, Shiney (calm abiding) meditation, and Longchen Nyingtig chod. Tsok (feast) offering pactices are observed twice monthly. For more information regarding scheduling see http://www.ewam.org/ewamSchedule.html. The local Montana sangha also publishes the Lion’s Roar, Ewam’s newsletter. They also run the Lion’s Den, Ewam’s store. Work has recently begun to construct 1000 Buddha statues to be situated in a specially-designed garden on the Ewam land in Arlee, MT. For more information regarding the design and meaning of this project go to http://www.ewam.org/ewamGarden.html . Take Highway 93 north. Travel 17 miles from Missoula to Arlee. Drive through town. 1 1/2 miles past Arlee, turn right onto White Coyote Rd. Travel down this road 1/2 mile. Turn left at little signs: “511”,”Ewam”. Drive down long driveway up and around the hill.